As the weekends away and meals out are always oversubscribed and tend to fill up almost as soon as they hit the website, we have to restrict them to current members of SWG40s. However, everyone is welcome on a pub night out, especially if you are new to the group or you are thinking about joining us. Before booking onto a weekend, please read the weekends away booking information on the FAQ Page. we could just go back and sit in front of the fire in the Gardeners yard. The cheese boards and pork pies are their specialities however there are also pies and mash, stews, goulash and other hot food available. Food is ordered at the table - no need to order in advance. Good beer and cider! Menu page 1 Winter Warmers They also have lovely ice cream. There is an optional walk starting at 1pm from Apperknowle - approx 8.5 miles and only 1200 ft of climb, with great views over the Drone and Moss valleys. More details in the walk programme. If you would like to join us for food - £5 deposit - please pay into group bank account - Account: 20198167, Sort Code: 60-83-01, reference: Cheese. Please text Bev on 07737 739 183 if you would like to join us for the meal as we need to book a table. Details: On the Sunday 17th February 10.00am, we are doing a Flat walk of 9 miles around Sheffield calling in at 5 Pubs along the way. There may be music at the last pub (The Dorothy Pax) and we will end with a curry at Mangla. From town we will be walking along the 5 Weirs heading to Meadowhall. Our first pub stop will be at the Wentworth (near the Arena, where we had the awards night) then onto the Crown just before Meadowhall, then The Steel Foundry (Weatherspoon’s at Meadowhall). Then we will head back along the canal calling at Noose & Gibbet before ending at the Dorothy Pax at Victoria Keys, with an option to mop up the beers/ coffees with a curry at the Mangla at Spital Hill. Details: Walk Leaders Meeting, 7:30pm, the Fat Cat pub in Sheffield (room upstairs). Email invite sent to all existing Walk Leaders, the meeting is open to all members especially if interested in leading walks for the group. Details: Our Area Ramblers are holding the AGM on Saturday 26th January. There we shall be meeting our new President, Lord David Blunkett, electing officials for the upcoming year, and discussing a Motion asking for improved public transport, especially in the evenings and on Sundays, for the many walkers who depend on public transport. The 5.5 mile walk will start at 10:30am from the venue at West Bretton Village Hall, WF4 4LB, and includes walking through the beautiful Yorkshire Sculpture Park. Coffees/teas will be provided by the Barnsley and Penistone Group. The weekend will be for 3 nights, with the possibility of staying an extra night for an extra £20. We are booking a large old townhouse (circa 1870) in the city centre, with 2 or 3 people sharing rooms. The cost will be £180 for the weekend per member, or £200 if you stay the extra night. There is a B&B, Bowen House next door for anyone wanting to book their own accommodation. This B&B allows dogs. We intend to put on a variety of walks in the local area such as the scenic Howardian Hills / Castle Howard country, Pocklington Canal and nearby villages/abbeys (all weather dependant). Needless to say there are lots of options for restaurants and pubs as well as other things to do. We need to know as soon as possible if you are interested - there are two places left in the house. The house is a large spacious townhouse within easy walking distance of central York and all the main tourist attractions. Totally refurbished in 2017, this period townhouse can comfortably host up to 12 people with a large kitchen, connected living and dining room, 3 bathrooms and a downstairs toilet. There is a private outdoor patio garden with seating and a brick BBQ. Not suitable for pets. Xmas is here!!! Come help us to Party. We are having a Christmas party on the 14th December from 7.30 pm at Crookes Social Club. We will be in the small concert room, just off the main bar area. Come and help us celebrate with a buffet and a Disco. The bar will have two hand-pulled real ales, as well as all the usual lagers, Cask Ales, Ciders, Wines, soft drinks and Spirits, for the more adventurous Gin and Tonic drinkers. The cold buffet will have both meat and vegetarian food, but if you have any intolerance to any food, please let me know. The cost will be £12.00 per person and all members and their family and friends are all welcome. Any questions you can text Tracey on 07903 440 314 or email the address above. Please book as soon as possible so I know how many to cater the buffet for, last bookings by the 10th December. Payments by bank transfer to Sheffield 40s walking group, Account 20198167 Sort Code 60-83-01, using the reference ‘Xmas Party’. If you prefer to pay by cheque please tell Tracey when you email to book on - payments are due on booking. NO CASH WILL BE TAKEN ON THE DAY. To get here:- By Bus: Take a 52 or 52a bus from Church Street or West Street (every 5-10 mins outward and every 15 mins back to the city centre after the gig) to Crookes (Brick Street or Duncan Road stops) and walk up Mulehouse Road. By Car: From Sheffield City Centre take the A57 toward Glossop and Manchester. After about a half mile after passing Sheffield University and Weston Park Museum (on the right) take a right turn onto Crookes Road. After a further half mile take a left turn soon after The Ball pub and opposite Pizza Hut onto Mulehouse Road. The venue is at the junction of Mulehouse Road with Suthard Cross Road - postcode: S10 1TD. We are having our annual Christmas Dinner at the White Lion pub in Great Longstone. For those that don’t know this is a laid-back, cosy, stone bar-restaurant serving cask ales and good food. The Christmas Dinner is £19.95 per person for a 3-course dinner including coffee/tea with mini mince pie. There is an excellent menu choice including gluten free and vegetarian. If you have an intolerance or allergy to any food, please add this info when you book. There are limited places available so book early to avoid disappointment. This pub gets booked up quickly. All orders must be paid for in full and placed by SUNDAY 18th NOVEMBER as the pub needs final numbers. Payments by bank transfer to Sheffield 40s walking group, Account 20198167 Sort Code 60-83-01, using the reference "White Lion". Please pay your £19.95 into the group account and email your menu choices with the subject title ‘White lion’ to sheffield40swg@gmail.com - payments are due on booking. Any questions you can text Tracey on 07903 440 314 or Mandy on 07586 842 361 or email the above email. car park behind the pub or on street parking. Short and long walks will be organised to coincide with the Christmas Dinner. There are 6 pubs to choose from, The Castle, The George, Bulls Head, Ye Olde Nags head, Ye Olde Cheshire Cheese Inn, Peak Hotel. It’s a very nice village, with great pubs, well worth a trip. Where we will sample the delights of any or all 6 pubs wonderful real ales, Ciders, Wines or for the hardy few, Spirits that they have on offer. Note: Unfortunately The Peak Hotel will not have a band on, but am sure we can make up for this with some singing of our own. The YHA Castleton Losehill Hall, Squires Lane, Hope valley, S33 8WB (0345 3719628 to book or the website www.yha.org.uk/hostel/yha-castleton-losehill-hall to book) is very reasonable from £26. This is less than a mile from first pub. Castleton Caravan + Motorhome Club Site, Castleton Road, S33 8WB (01433 620 636) or website to book www.caravanclub.co.uk/club-sites/england/peak-district/derbyshire/castleton-caravan-club-site/ this is ½ mile from first pub. From £16.45. Any queries you can text Tracey on 07903 440 314. Would be nice to know who is going, so please text Tracey, but you can just turn up on the night if you wish. Details: Our AGM will be held on Thursday, 15th November 7:30pm at The Fat Cat, 23 Alma Street, Sheffield. S3 8SA. At the AGM a new committee will be elected. There are six roles that make up our committee. If you are interested in any of the roles please put your name forward with the name of your proposer and seconder, via email, to the committee by 18th October 2018. Vacancies – Secretary (General and Membership combined under one role) and Treasurer. Emma Myers and Jill Brogden respectively are no longer able to continue in their roles so now is your chance to join the team that runs the group. I am pleased to announce that the rest of the committee members are standing for re-election. There is a brief description of what each role entails on our website. If you would like any more information please ask the relevant current committee member, via email or on a walk. Meeting 7.15pm at the Nottingham House 164 Whitham Road Broomhill Sheffield S10 2SR. At 7.30pm we will set off to walk to Dam House Pub Mushroom Lane Sheffield S3 7NZ. Dam House is in Crookes Valley Park (next to Weston Park & across the road from Ponderosa Park). Fireworks are due to start at 8pm. We’re heading to Hawes for a hiking weekend, 26-28 October 2018. Friday meet-up is in The Chippie at 8.00pm. Please note, The Chippie isn’t licensed and you can’t BYO, but there are a number of pubs in Hawes where we can go after we’ve eaten to discuss the following day’s walk(s). - If you would like to lead a walk and, if so, length and grade of walk. Two walk leaders are already signed up for the weekend, with walks planned (details to be confirmed). Please note, if you are thinking of going to Hawes, 26-28 October is the half-term weekend (the end for some counties, the beginning for others) and it’s the weekend the clocks go back, so book early! Notes: bring head torch given time of year. The route is weather dependent given there's a lot of off-path walking. From Hawes to the side of Dodd Fell Hill to Cam High Road. Wether Fell, onto Burtersett and back to Hawes. Notes: will be done at a reasonable pace. The walk begins in Askrigg, a short drive from Hawes and in the right direction for the drive home! The walk incorporates Nappa Hall and Whitfield Gill Force. Details: This is the 44th Annual Beer and Cider festival taking place at Kelham Island Museum from 10 -13 October 2018. There is a small charge for entry each night (For CAMRA members: Thursday is free, Friday is £2 and Saturday £1). The event is usually busy and it has a good atmosphere. Tracey and Wayne are going on Friday and Saturday. If you would like to let me know you are going or to ask questions you can ring me or text me on 07903 440 314. Colin is organising a meal at the Greek restaurant Parthenonas on 21st September Friday at 8.00 pm. Cost per head dependant on what's ordered, but if you have a 3 course meal this will be approx. £16/18, I believe there are offers that could be used via Groupon.co.uk but I can't guarantee, easier for individuals to check. You need to pay £5.00 deposit to secure your place - please to do a bank transfer to Colin Percival Account no: is 28009368, Sort code: 11-81-75. Please text me on 07505 936 025 to say you are coming. Their website to see is http://www.parthenonas.co.uk to see the menu. 4th Annual Rail, Ale & Blues Festival, Cleethorpes. We are attending the 4th Blues festival in Cleethorpes, Free Entry. Friday 14th September from 7pm, finishing Sunday 16th September band finish at 3pm, see program for the great bands. Over 50 Real Ale and Ciders, food available and the Miniature Steam trains will be running for short trips all weekend. The Campsite (Cleethorpes Showground Caravan Park, Meridian Road, Cleethorpes, DN35 0AR, 07522 551 877) is right next door, book yourselves in. There are also various B&B and Hotels in Cleethorpes. Email invite sent to all existing Walk Leaders, however the meeting is open to all members especially if interested in leading walks for the group. We will end the night (if you can face, another drink) at the Broadfield, Abbeydale road (two doors down) which is also an interesting , rustic style Victorian pub with mismatched tables and chairs, train station memorabilia and stripped floors. Details: We will be attending the Blues stage for Tramlines again. C.A.D.S, 7 Smithfield, Shalesmoor, S3 7AR. One more Waltz in The Courtyard, Free Entry. Real Ale, Cider, Wines and Food Available. Music available from 7.30 PM on Friday 20th July till Midnight and from 13.00 PM on Saturday 21st July till Midnight. For more information contact either Jean 07795 203 867 or Tracey on 07903 440 314. Details: The festival runs from Thursday 5th July to Sunday 8th July. We are intending meeting up from 5.00 pm in the Car Park on Saturday 8th July, though some of us will be there on Sunday if you would like to meet up then as well. Sunfest is now a well established and much anticipated annual event which draws in lovers of real ale & cider from across the country. Over 100 real ales and ciders can be found in our outdoor beer tent, with Abbeydale Brewery regulars available on the bar. The weekend also features a selection of live music and entertainment. Opening times 12pm-11pm Thursday & Sunday and 12pm-11:30pm Friday & Saturday. Both the pub bar and festival will shut simultaneously. Details: Michael The Legacy - A jaw dropping tribute to Michael Jackson celebrating his life and music. Ultimate David Bowie Tribute Show - Prepare to be transported across 40 years of Bowie - from Spaceboy to Superstar. Come & join in the party. After you have purchased your ticket, please text Tracey on 07903 440314 to find out the inside meet up details. This is Colin, I've found out that the Dent festival sorry to say is cancelled for this year due to I believe an unfortunate death of a well known organiser. Although this has happened I'm willing and still going to go to support the village plus there will be some musicians doing small gigs. I feel this is only right as we've been going there for so many years and feel sorry again that such a great occasion and venue is not happening and I'll convey all our thoughts to those concerned. Details: We will be heading off for a group weekend away to Keswick in the Lake District. The mountain festival is held every year and we thought it would be good to combine it with a group weekend away. Keswick, according to your man Alfred Wainwright “is…the best single base of operations.” It is indeed a great location for all kinds of walks along with many options for accommodation including B&Bs, Hostels, Self-catering and Campsites. Group walks will be arranged for during the day but the festival also offers many activities that you may like to try. On both Friday and Saturday evening there is live music at the festival park where the stage, overlooking Derwent Water and surrounding fells, must have the best backdrop of any venue in the country! Please text Jill Brogden 07940 415 695 to book on for the weekend and we will keep you up to date with any group activities. Please book your own accommodation. Full details of walks will be posted on to the website nearer the time. 3 Valleys sees a whole raft of pubs, clubs and breweries putting on small beer festivals on the same day and fund a free bus service linking all the venues with Dronfield rail station. Entry to all the venues is also free of charge so it is a great value day out featuring beer, cider, food, live music and scenery. New venues confirmed for this year include Fuggle Bunny Brewhouse and the Butchers Arms at Marsh Lane with returning favourites including the Miners Arms at Hundall, Hyde Park Inn at Hill Top, the Jolly Farmer and Miners Arms in Dronfield Woodhouse whilst in Dronfield itself the Dronfield Arms, Green Dragon, Manor House Hotel, Blue Stoops and Pioneer Club are all back again for 2018. It is expected there will be a few more venues still to be announced. One cluster of venues that have proved very busy in the last few years are those on Dronfield High Street – Blue Stoops, Manor House and Green Dragon – all offering outside bars, music and street food stalls – so new this year will be a road closure to make it easier and safer to walk between these venues and provide more space to eat and drink outside! As a result the festival buses will serve these venues using the stop in the Civic Centre. Details: Friday 1st June 2018 at the Wentworth Pub, 32 Milford Street, Sheffield, S9 2LD, Time: 7.30 pm for Pie and Peas at 8.00 pm, dancing later on. We are organising an Awards night to celebrate all the good work our walk leaders do, we have awards and certificates for various things: Leader who has led the Most walks, Longest walk, Most people on a walk, the wettest walk, the Muddiest walk, Most Memorable / best costume, Person who went above and beyond on a walk. We also have a photo competition which will be voted for on the night: Best Landscape Photo, Best Photo, and Best Quirky/Unusual Photo. Vegetarian option and Gluten free option, please mention any other food allergies at the time of booking. We will present the awards after the meal, we have a laptop that will provide music, so we can dance, or the beer garden is a lovely place to relax and catch up with other walkers. Details: The Barrow Hill, the most atmospheric beer Festival of the year, opens Thursday 12.00 to 5.00 pm, Friday 12.00 to 11.00pm and Saturday 12.00 to 11.00pm. This is held at the Roundhouse, Campbell Drive, Barrow Hill, Chesterfield, S43 2PR. New for 2018 we are delighted to introduce the "Gin Palace Bar" serving a range of artisan gins from across the country. For music lovers there will be fantastic live music in the marquee and on the main stage from jazz and brass through acoustic, funk and soul to rock and roll. The Food Court will be on hand to provide visitors with a tasty range of food to suit every appetite from pork pies to pancakes and hog roast to pizza; not forgetting the chocolate, the cheese and even coffee! Entry to the Festival also includes entry to the museum and the new exhibitions and interactive displays provided courtesy of the Heritage Lottery Fund project that was completed in September 2017. The dedicated FREE bus service will also be running from Chesterfield railway station into the Festival on all three days. There really is something for everyone at Rail Ale! New for 2018: Rail Ale presents the first ever Grand Thursday Evening Concert starring Pink Floyd tribute band Floyd in the Flesh. This is a separately ticketed event to Rail Ale 2018. Please click here to buy tickets for the Floyd in the Flesh concert. For more information on the event, please visit www.railalefestival.com. Details: New members night at the Grapes pub, 92 Trippet Lane, Sheffield, S1 4EN. Meeting in the Kennedy Room from 8.00 pm. Just a general get together for new members to meet existing members and some of the committee. Maybe going to either Maggie Mays or The Bessemer for a boogie later. All welcome, for enquiries ring or text Tracey on 07903 440 314. Details: The Isle of Skye is a walkers' paradise. From easy going walks on the spectacular coastline to dramatic scrambles in the Cuillin mountains, the most challenging in Britain, the island provides fantastic walking for everyone. We will be based for a week at the village of Carbost which is ideally placed for all our activities. The village has a shop, pub and café and is home to the Talisker distillery and visitor’s centre. We have rented two cottages in the village sleeping 10 in total. Cost for the 7 nights is £120 per person for a shared room sleeping 2. It may be possible to book a single room – please ask for a price. On confirmation of your booking, a deposit of £20 will be required and the balance payable by 31st January 2018. Payments by bank transfer please, payable to Sheffield 40s Walking Group, Sort code: 60-83-01, Account no: 20198167. If you prefer to pay by cheque please let Jill know. Bunkhouse and B&B available at the Old Inn. Camp site for Motorhomes (no tents) is also available on the outskirts of Carbost, near to the cottages. The accommodation in Carbost (and on Skye in general) is very much in short supply and quickly gets booked up, so if you would like to join us please get booking! Jim Perrin: one of Britain's finest outdoor essayist" according to Robert Macfarlane. He is Manchester-born, radically left-wing, a prolific author, the Guardian country diarist for Wales, and a TGO columnist. In earlier years he was one of Britain's leading rock-climbers. A close friend of Benny Rothman, he has had a passion for the Peakland moors since his early teens. Keith Warrender: a leading expert on the Trespass and has been giving talks on the Kinder Trespass for nearly forty years. He writes and publishes books about the local history of Manchester, Cheshire and the Peak District, and published Benny Rothman's account of the Trespass. We are organizing a curry night at Aagrah Indian Restaurant, Unit 1, Leopold Square, Leopold Street, Sheffield, S1 2JG. We have booked a table for 20, bookings open for this event on the 6th April (organizer away, so don't text before this date) We may go on to some of the local pubs after, music and dancing may be involved if anyone is interested after a big meal. www.aagrah.com/find-a-restaurant/sheffield to look at the lovely food. NB: The planned talk by Sarah Slowther from the Peak Park Authority has been Cancelled, the meeting will therefore start at 7.30pm. Details: Comedy Club Friday 23rd March 2018, at the Sheffield City Hall. Doors open at 7pm - Show starts at 8.15pm with dancing after if you wish. Price is £18.00 per person with 12% telephone/online booking fee - total: £20.16 (a 5% fee if you go to the Sheffield City Hall Box Office) see link below. We will be meeting in Wetherspoons (Benjamin Huntsman, 12 - 18 Cambridge Street, Sheffield, S1) from 7pm and heading to the City Hall at 7.30pm. Contact Jillian Gilbert (07771960531) if you are coming along. Details: We are going to the Bradwell Pantomime! Bus Service 272 from Sheffield Interchange 18.20 arrives Bradwell 19.04. For those unable to attend Friday the Pantomime is running from Wednesday 21st - Saturday 24th February, each performance starts at 7.30 pm Matinee 2.00 pm Saturday 24th. Details: Walk Leaders Meeting, 7.30pm, The Fat Cat pub in Sheffield (room upstairs). All Leaders welcome plus any other member who is interested in becoming a Leader. SYNED AGM - Rotherham - Come and meet walkers from other groups in our Area and help decide our future! Details: Our Area (SYNED) AGM is on Saturday 27th January, 2018 at 2:00pm. There will be a morning walk starting at 10:30am from the same location as the AGM. Rotherham Metro Rambles are hosting the AGM this year. The church is on Wickersley Road near the ‘Stag’ roundabout on the A630 (A6123). It is 2.5 miles from J33 of the M1 and 3 miles from J1 of the M18 (via the A631/A6021). The church is approximately 2 miles from Rotherham town centre where both bus and railway stations are located. Bus numbers X1, 19 and 19A all stop close to the church. Facilities available from 10 am to 10.30 am prior to 5.5 mile rural walk around Whiston and Wickersley. Details: One of the best places to sample Real Ales is in Sheffield’s very own Valley of Beer, Kelham Island. We are organising a pub meet on Friday 26th January starting at The Ship Inn, 312 Shalesmoor, S3 8UL. The Ship Inn will be offering a host of craft beers, specialist spirits, gourmet coffee in a newly revived urban bar setting. Then we will move on on to The Kelham Island - carved wooden bar, tiled floors, leafy beer garden and renowned range of real ales, national CAMRA pub of the year twice in a row. Just around the corner is the Fat Cat, the tap for the Kelham Island Brewery. Another beautiful old pub, real ale and real cider, it is the epitome of a proper British pub, with a proper British beer garden. We end night at the Riverside in Mowbray Street, nestled on the banks of the river Don. The Riverside is one of the most eclectic and best loved Sheffield Venues. Since being taken over by True North Brew CO in 2015, it has been given a mini-makeover, has been unveiled focusing on Quality. If you have any queries or would like to let me know you are coming, please text Tracey on 07903 440 314. Details: We are holding our Christmas Party at The Riverside, 80 Catch Bar Lane, S6 1TA (near Sheffield Wednesday ground) on Saturday from 8.00pm. We will have Pork Sandwiches and Roast Potatoes, with a vegetarian option. There is a proper bar with two hand pumps of real ale, as well as wines and cocktails, etc. We will be having a DJ for some wonderful Boogie music as there is a dance floor. There is a small room which leads to the patio terrace, which overlooks the river and the football ground, which is a nice place to get away from the dancers for a quiet chat. The cost is £12.00 and all Members, and their Family and Friends are welcome. To book, email the committee on sheffield40swg@gmail.com to say you are coming and if you need the vegetarian option. Please book by 10th December. Come along and help us celebrate the festive season!! Christmas Dinner will be from 5.00 pm, Price for a three course meal with coffee and mince pies is £22.95. Menu attached. We are planning to do two walks on Sunday from the car park, one short (with a later start,) and the longer walk, details will be on the walks program once organised, planning to meet up in Grindleford and go for a Meal at The Sir William Hotel, Grindleford, Hope Valley, S32 2HS we have booked the function room but there is only 45 spaces, so you need to book early to avoid disappointment. Christmas menu - please state your preference when you email the group to book your place. As we will be eating at 5.00 pm there will be a mince pie and drink stop on the walks. The hotel has asked if we don’t take in boots and rucksacks. Is there any member who could bring a musical instrument and play a couple of carols whilst we are in the pub? After trying some of their wonderful tipples, we will head up the road to the Frog and Parrot, Common Room, and end up at the Green Room, where they normally have a DJ till late. All new members and existing members welcome, this is a good opportunity to mingle and chat to other members as well as members of the committee and the social committee. If you have any queries before the night, you can text Tracey on 07903 440 314. If you are coming it is always a good idea to text the organiser, so we have an idea of numbers. Details: Meeting 7.15 p.m. at the Nottingham House 164 Whitham Road Broomhill Sheffield S10 2SR. At 7.30 p.m. we will set off to walk to Dam House Pub Mushroom Lane Sheffield S3 7NZ. Dam House is in Crookes Valley Park (next to Weston Park & across the road from Ponderosa Park). Fireworks are due to start at 8.00 p.m. Details: To help us celebrate this milestone, we are arranging two walks on Sunday 22nd October both from Hope, Long walk organised by Wayne and the short walk organised by Emma (Details will be on the website soon, on the walking page) both to finish about 5.00 pm. We will be meeting for drinks in The Woodroffe Arms, 1 Castleton Road, Hope, having a Chinese style buffet in the restaurant inside the pub called The New Golden Dragon from 5.30pm for 6.00pm. There will be limited numbers (45 only), so please book early to avoid disappointment, the cost will be £14.00. To book the Meal members should send their money by electronic transfer before 14th October to account number: 20198167 Sort code 60-83-01 (using the subject heading Anniversary Meal) or email swg40s@hotmail.co.uk and we will send you an address where you can send a cheque to. We cannot take money on the day, sorry. Please email swg40s@hotmail.co.uk when you have done this to secure your place and let us know if you are a vegetarian. For anyone staying or catching the train or have the pleasure of a designated driver there are 2 other pubs close if you wish to carry on after the meal, The Old Hall hotel and The Cheshire Cheese. There is a public car park, Castleton Road, S33 6RD next door to the pub or various parking near the school on Eccles Close just off Edale Road. The pub has limited parking. There is also a train you can catch from Sheffield at 9.14 am arriving in Hope at 9.40 am(S33 6RR, 0.8 miles from pub) you can book this yourself by going on WWW.thetrainline.com. One way is £5.60. Hope to see you there, if you have any old photos or stories about the beginning of the group, please can you send them to swg40s@hotmail.co.uk will be nice for new members to see what the group got up to back in the day. Any queries you can text Tracey on 07903 440 314. Details: Our AGM will be held on Wednesday 18th October 7:30pm at The Fat Cat, 23 Alma Street, Sheffield. S3 8SA. At the AGM a new committee will be elected. There are six roles that make up our committee. If you are interested in any of the roles please put your name forward with the name of your proposer and seconder, via email, to the committee by 14th September 2017. Vacancy – Walks Co-ordinator. Martin is no longer able to continue in the role, so now is your chance to join the team that runs the group. Note you only have to co-ordinate the walks not lead them! Details: Rotherham Metro and Dearne Valley Ramblers are holding a walking festival from Weds 11th Oct. to Sun 15th Oct. There are 8 walks, covering sites such as Wentworth Woodhouse, Thrybergh reservoir, Manvers Lake and the River Dearne. Walks range from 5 to 10 miles. Walks are free and open to anyone. Fire dance group extraordinaire Mr Fox commence their dance nearest the full moon before the fifth of November, called the Hunters Moon. Hosted at Wortley Men’s club, entertainment and cask ales served at Camra club of the year 2017. As this place gets mentioned in all the Sheffield What's On brochures, we thought we would give it a try. If it turns out to be unsuitable we will move on after 9.30 p.m. to the nearby Sheaf House/Brothers Arms or down London Road towards town. Text Jean 07795 203 867 for further information or if you plan to arrive after 9.30 p.m. Details: Anne Bradford is organising a walking weekend in Dent in the Yorkshire Dales, Friday to Sunday, 15-17 September 2017. Garda View B&B has three rooms. They all have zip-lock beds, so can be booked as twins or doubles. Anne has reserved all three rooms, two of which are still available. If you wish to book one of the remaining two rooms, please call 015396 25209 and speak to either Sue or Les Howes, explaining you’re from the Sheffield 40s walking group. A £20 deposit is required to secure each room. The B&B owners also run the well-stocked village store. A fish and chip supper has been organised on the Friday evening at 7:30pm at the Meadowside Café. We have sole use of the premises – minimum number 15, maximum number 40. The cost is £8.50 per person, payable in advance (no money, no meal!). The café is licensed, with a selection of wines, lagers, ales and ciders, as well as non-alcoholic drinks and teas and coffees. They also serve cakes and desserts if you’re still hungry after the fish and chips! £8.50 is the cost of the fish and chip supper only. You will need to settle your own bill for any additional food and drink you purchase. Deadline for confirmation and payment is 4th September 2017. A BBQ is being organised for the Saturday evening. Please bring with you the food you would like to eat on the evening – no chicken please, as this takes longer to cook – but sausages, burgers, ribs, or vegetarian option – bread buns, salads, etc (the usual BBQ fayre). We potentially have 2/3 walk leaders, and walks will be advised on Friday evening; however, if you are familiar with the area and would like to lead a walk, please let Anne know. Please contact Anne on 0778 936 4149 to let her know that you are going, where you are staying and if you would like to lead a walk. Most importantly, you will need to pay for the fish and chip supper in advance, so please contact her for her bank details. She’ll settle the bill with Meadowside café for the fish and chip supper only. Details: There is a free Rail Ale Blues Festival that some members are planning to attend. Jean has arranged a walk for the Saturday - details in the walk calendar. Food & drink are available for purchase at the venue. Walkers are welcome to book their own accommodation if they want to join in with the full weekend festival. Jillian Gilbert is organising a weekend away to Keswick in the Lake District. This will take place over the August Bank Holiday and you will need to book your own accommodation. Saturday Jillian will be leading a B2 walk and Godfrey will be leading a C3 walk. Sunday Jillian will be leading a A2 walk and Mick will be leading a C3 walk. A comedy hypnotist with pie & pea supper has been arranged for Sunday evening at the Skiddaw hotel, anyone not booked on speak with Jillian or book direct on: 01768772071 cost is £18.00 per person. No confirmed arrangements for Monday, options of walks, or the Keswick Agricultural show at Braithwaite - Adults £8 Senior Citizens £5. Free parking adjacent to the show ground or a free shuttle bus from Keswick to the showground. Meet in the Oddfellows Arms pub from 8.00pm on the Friday night. For further details and information on walks available please contact Jillian. Details: There are 6 pubs to choose from, The Castle, The George, Bulls Head, Ye Olde Nags head, Ye Olde Cheshire Cheese Inn, Peak Hotel. Very nice village, great pubs, worth a trip. Leaving Sheffield Interchange (meeting point is the 272 bus stop in the Interchange) at 6.20 pm on 272 this is a ‘Hulleys of Baslow’ bus (have included the schedule if you want to get earlier or later bus) getting us into Castleton at 7.16 pm, where we will sample the delights of any or all 6 pubs wonderful real ales, Ciders, Wines or for the hardy few Spirits that they have on offer. As we like Blues music and this event is Free to get in, the local venue that has this kind of music is at C.A.D.S, 7 Smithfield, Shalesmoor, S3 7AR. There is a bar in the courtyard (this serves Real ale, Cider, Wines and some Spirits). There will also be a BBQ and Veg Food. Details: Bit of a late entry social weekend! The Birchover Carnival & Music Festival (Bananallama Festival) is taking place on Saturday 15th July 2017. On the Saturday afternoon there will be a carnival in the village with stalls, entertainment, food/drink and lots of summer bunting. Then in the evening there is a music festival held at Barn Farm campsite. Tickets are £33 per person for two nights camping (Friday 14th and Saturday 15th), and the price includes the music festival and a £3 booking fee. There are no walks planned at the moment, but there are plenty of routes out of Birchover if anyone fancies a walk. Please text Linda on 0755 779 0861 if you are going. SunFest Beer Festival - meet 5pm in the car park. Live music and food. The festival runs from Thursday 6th July to Sunday 9th July. If you have any questions you can text Tracey on 07903 440 314 or Jean on 07795 203 867. Details: We are making a day off this walk, hopefully ending up on the beach for games (rounder’s or cricket) ending the day with Fish and Chips (either in paper the old fashioned way or in a restaurant) If you are interested in the wildlife, the sea birds are spectacular at this time of year. Flamborough Head to Bampton Cliffs and back (about 8 miles if returning the same way or 11 miles if returning via Flamborough and South Landing - it should take about 4 - 5 hours. I will also allow for time at Bempton Cliffs RSPB reserve for viewing the seabirds (about 40 mins - 1 hour). Binoculars are recommended. After the walk - I’m guessing we should be back around 3:30 pm - there should be time to visit the beach at either Filey or Bridlington. There is parking at Filey near a golf course and at Bridlington north beach. There are also a number of Fish n’ Chip restaurants in Filey just a short walk along the promenade and at North Beach in Bridlington. Details: We are off to the beautiful village of Dent in the Yorkshire Dales for their annual free festival. More than 25 artists will perform on our main stage marquee, and new to this year will be the open mic stage located in our undercover seating area. In Dent village you'll find two lovely pubs, the Sun Inn and the George & Dragon, within very close walking/staggering distance in Dent, where music of all varieties will ring out throughout the day and (probably long) into the night. Add to that the street performers in the cobbled streets - clog and traditional dancing and other individual and group musicians (sometimes impromptu) - and you'll have a totally unforgettable experience. And... if you haven't had enough after all of the organised activities have finished, potter along to one of the two nearby campsites - more than likely you'll come across a group of musicians who just can't bear to quit and go to bed and you'll be treated to some mellow, acoustic tunes to prepare you for slumber. The cost is £22.50 per night for the 2 nights camping - two people and a car. Wristbands usually £5 for cheaper beer, and the music is free. Please email Colin Percival to book: colina1957@gmail.com or call him on 07505 936025. If you like your accommodation to be a little more luxurious you are welcome to go ahead and book yourselves in and join us for the fun. As the focus for this SWG40s weekend away is the festival. There are no planned walks being led by the group. Details: THE THREE VALLEYS FESTIVAL ON 3RD JUNE IN DRONFIELD. This is back for another year, with 13 pubs taking part, providing a great choice of beers, ciders, foods, atmosphere and music, all linked by a special free bus service running from Dronfield station in three continuous loops (running from midday to 9.00pm) hop on and off at whichever pub you want to visit next. Details: Awards night Friday May 12th at Regather in Sheffield. We are having a celebration to thank our walk leaders and hand out Awards for various types of walks including, Most led walks, Wettest walk, Longest walk,etc. On the night we will vote for the best photo competition. We will be supplying a buffet style food, there is a bar inside as it is the site for the regather Brewery, 57-59 Club Garden Road, Sheffield, S11 8BU, just off London Road. The parking here is a bit limited (street parking) we will have music from a laptop, so we can have a dance after the Awards. Then we will go to 'The Cremorne' pub after as this is a late night pub with a disco. If you would like to come and join in please book your own accommodation, there’s plenty of accommodation to choose from - hotels, b&b’s, self catering and hostels. It’s an informal weekend but if you let me know after you have booked, Ill try to organise a group meal for Saturday night. Any volunteers to lead walks would be much appreciated. Please contact Mave (07792 575698) if you are coming. Ambleside is set in the centre of the Lake District at the head of Lake Windermere this market town provides everything a visitor could want from the numerous shops, to the many drinking and eating establishments. An ideal base for walking Ambleside has easy access to the surrounding fells and mountain, the beautiful Stock Ghyll Force is also nearby. Boat trips on the lake, shops, galleries and craft shops means there are plenty of alternatives if you don’t want to walk. Details: This year marks the 85th anniversary of the Mass Trespass and the theme of the conference will the work being done by the National Trust and others in the re-wetting and re-wilding of Kinder Scout. It is also hoped that the launch of a book ‘Clarion Call’, which consists of some wonderful old photos of Clarion Ramblers’ members, and items on the early development of walking in our area, will be launched at this event. The event is organised by SYNED - the Area organisation representing our local Ramblers groups. First aid for walkers and basic navigation - This workshop split into two sessions. The first aid section is run by the British Red Cross and aimed at anyone who goes out walking. It will help you build your knowledge so that you feel confident if something ever goes wrong. The navigation session is for new walkers, or current walkers who would like to brush up on their navigation skills. Introduction to walk leading - This workshop is for anybody who leads group walks. It goes through the process of preparing for walks and leading them. There's lots of opportunity to share ideas. Getting more people walking - This is for any volunteer who is involved in the development or promotion of a walking programme. It focuses on using the web, Ramblers Routes and Group Walks and Events Manager to make group activities engaging and attractive. Using social media to promote your group - This workshop is aimed at volunteers who want to do more social media promotion. It will help you to identify and reach your target audience, create engaging messages and build an online community using social media. Basics of Rights of Way - This workshop is aimed at anyone who is involved in our Rights of Way work or would like to know more. It is an overview of the law relating to Rights of Way and access it covers some of the most common questions we get asked about by members of the public and volunteers. How to run successful short walks - Short walks are a great way to diversify your group walks programme and to attract new walkers and leaders. We'll look at what makes a successful short walk, ideas to get other volunteers and walkers interested, and how to integrate short walks into your programme. Details: Meeting 7.45 pm at the Riverside Pub, 1 Mowbray Street Sheffield S3 8EN. Moving on approx. 8.15 pm to Peddlers Market 92 Burton Road Neepsend S3 8BX (bus route 7/8 or short walk from Shalesmoor tram stop to the market). Peddlers Market - featuring a variety of street food traders, craft stalls, art, music and a number of bars with a range of real ales and craft beers available. The featured breweries change each month. Sheffield Brewery which is just across the road also open on the same evenings for their Beer Club tap session. (free entry to both). 92 Burton Road is a large indoor warehouse, warm coats recommended. After the market the plan is to move onto The Bhaji shop/Thali Café 2A-2B Ball Street S3 8DB. Details: This year, WE, Sheffield 40s, are organising our Area AGM, so please come along and help! There is a walk in the morning (10:30am to 1pm), starting from Bradfield Village Hall. Teas and coffees will be served in the hall, bring your own lunch. The AGM will start at 2pm and last about two hours. We will have short talks covering Clarion Ramblers, re-wetting moorlands, and an update on Ramblers work nationally. Please come along and find out what we are up to in our Area of Ramblers. Also we elect the new Area Council, and our Area delegates to the national Ramblers General Council. Details: New members night at the Grapes pub, 92 Trippet Lane, Sheffield, S1 4EN. Meeting in the Kennedy Room from 8.00 pm, Just a general get together for new members to meet existing members and some of the committee. Maybe going to either Maggie Mays or The Bessemer for a boogie later. All welcome, for enquiries ring or text Tracey on 07903 440 314. Details: Join us to bring in a Happy New Year at Allendale in Northumberland. Allendale is situated in the North Pennines Area of Outstanding Natural Beauty, one of the most remote and unspoilt places in England. The landscape here is ‘of tumbling waterfalls and vast heather moors, where peatlands meld with ancient hay meadows’ so we should be in for some excellent winter walking! Allendale’s vibrant community is also renowned for throwing a party. Most famous is the Tar Barle, a unique New Year celebration. Revellers called ‘guisers’ carry whisky barrels filled with blazing tar on their heads. This festival of fire dates back to 1858 and attracts onlookers from far and wide. Staying at Allendale Bunkhouse in the centre of the village, we will be perfectly located to enjoy all that the area has to offer. The bunkhouse is available for 24 people sleeping 2 – 4 per room. The total cost for the 3 nights accommodation is £115 per person. Payments by bank transfer please to Sheffield 40s Walking Group, Sort Code 60-83-01, Account No 20198167. If you would prefer to pay by cheque please tell Jill when you text to book on. Payments are due upon booking. You are also welcome to book your own accommodation and join us for the walks and festivities. Please text Jill to let us know you are coming. Details: Christmas Party at the Shakespeare’s Pub, 146-148 Gibraltar Street, Sheffield, S3 8UB, from 8.00 pm. Come and party the night away - we have a great DJ (DJ Gandhi) and gorgeous curry (by Mangla), and the pub has won CAMRA pub of the year. We have the two upstairs rooms (the Bards Bar) - one for the buffet and chatting, one for the dancing. Please book by 16th December. Payments by bank transfer please to Sheffield 40s Walking Group, Sort Code 60-83-01, Account No 20198167. If you would prefer to pay by cheque please tell Tracey when you email to book on. Payments are due upon booking. Details: There will be a bonfire and fireworks in Chelsea Park on Saturday 5th November. It is organised by the local scouts and is always really good. There will be a collection for the scouts on the night to contribute to the cost. I will confirm the start time when it's announced and we will be meeting from 6 pm in the Byron House Pub on Nether Edge road. So If you would like to join us to celebrate bonfire night at this great venue text me, Sue, on 07952148619 to let us know. Details: Please come along and find out what we have been up to, and how you can get involved. Upstairs room booked for maximum number of 34. Food to be ordered from the menu on the night. No deposit necessary. Please text Jean on 07795 203867 to confirm booking. Please also let Jean know if you have a change of plan and have to cancel, there may be a waiting list. BBs need to know exact numbers. Take your own wine (no corkage) or purchase at the restaurant. Details: Come to Chesterfield for a great night out visiting the best pubs on the Brampton Mile. Trains run regularly between Sheffield and Chesterfield and the last train listed from Chesterfield on Fridays is at 00.55 so there is plenty of time to enjoy the pubs and music! There is also an earlier train at 22.45 . The best way to reach the first pub we will visit ,The Rose and Crown , is by sharing a taxi from the station. I will be at the Rose and Crown from 8 p.m. and we will visit some of the best other pubs along the mile finishing at the Royal Oak where there is live music from 9 p.m. onwards. Having reccied this great pub crawl, I know we will have a brilliant time. If you need any more details please call me, Sue, on 07952148619 and please also text me on this number to let me know if you are coming. Details: A great weekend away in the North Yorks Moors organised by Gill Green, a SWG40s member and a walk leader for our group. Walks are being led on Friday, Saturday and Sunday but please organise your own accommodation. Meeting place each day would be the White Swan pub and campsite at Newton upon Rawcliffe. Tel no: 01751 472505 for campsite bookings. Cost is £8 per night for a tent or campervan + £4 per night for electric hook-up. The campsite is directly behind the White Swan which does excellent pub grub. Book early! Other possible accommodation is B&B at Elm House Farm 01751 473 223 or Swan Cottage (next door to the White Swan pub) 01751 472 502. There are numerous holiday cottages in the village too - take a look on sykescottages.co.uk - if people wanted to organise sharing and self-catering. Places on the weekend will be limited to 20 people so please contact Gill to ensure the weekend is not already fully booked before arranging accommodation. You're welcome to join this event for a long weekend or just a day walk, but please let Gill know if you want to join the group for a meal at the White Swan on the Saturday evening. Details: Join us for a late summer weekend in and around the beautiful village of Buttermere, the Lake District. Our walks programme for the weekend has walks led by James both Saturday and Sunday. They will be high level, ‘B3’ walks of around 10 miles and 3,000 feet ascent. If you prefer something less strenuous, there is a great choice of more tranquil, lower level walks around Buttermere which can be self-guided. All walks, as always, will be weather dependent. We have booked rooms to stay Friday and Saturday nights at the YHA Buttermere or you are welcome to book your own accommodation. Our rooms at the hostel sleep 4 per room. The cost for the 2 nights accommodation is £60 per person. Bookings will open on Monday 18th July from 6pm. To reserve your place, please text Jill Brogden 07940 415 695. Payment is due upon confirmation of booking. If you have arranged your own accommodation and would like to book on for the walks, please text Jill. Details: This should be good fun folks! A Caribbean band, themed buffet, limbo competition, and resident DJ at Baldwin’s Omega on Saturday 9 July. Dress code is ‘ colourful with style’ and arrival is 7.30 for 8pm buffet. The bar is open until 1am, and tickets cost £26. If you would like to join us, please phone Baldwins (255 3263) and check if there are any tickets left. If you are in luck ask for a ticket to join the party booked under Debby Clark. You have to put down a £10 deposit and the balance can either be paid in advance or on the night. Please text Debby on 07791 143494 as well to let her know you are going. Details: Sunfest Beer Festival 2016 at the Rising Sun, 471 Fulwood Road,S10 3QA on 7th July starting at 12.00 pm till 10th July finishes at 23.00 pm, with 100 real ale and ciders, as well as music and events throughout the weekend. Any questions us the link to look at the web site Sunfest Beer Festival Details or ring Tracey on 07903 440 314. Details: Saturday 2nd July 2016 (7:00pm onwards) Music in the Gardens, Botanical Gardens, Clarkehouse Road, Sheffield. Tickets : £35 in advance £40 on the gate selling fast. Advance booking via S.I.V. or at the cafe inside the park entrance. Meet just inside main gate at 7:00pm. Drinks @ food available but can bring own. Bring a seat @ possibly an umbrella. The cost is £22.50 per person for the 2 nights camping - two people and a car. Wristbands usually £5 for cheaper beer, and the music is free. Pitches are limited so please email us at swg40s@hotmail.co.uk to secure your place. Payments by Bank Transfer please to Sheffield 40s Walking Group; Sort Code 08-60-01 Account number 20198167 to be received when you book on to reserve your place. If you prefer to pay by cheque, please let us know. Details: New Members night social, a chance to get together with other new members as well as some existing members as well as people on the committee and social committee on the 10th June at 'The Grapes pub, 80 Trippet Lane, S1 4EZ' in the Kennedy Room from 8.00 pm, All welcome. May go to the 'Dog and Partridge' or 'Maggie may's' later for a boogie. Call Tracey on 07903 440 314 for any more information. Details: If you would like to join us at this event please purchase your own ticket from the City Hall box office - 0114 2 789 789 or on line at www.sheffieldcityhall.co.uk £21.45 including booking fee. Front right stalls. We are heading for the walkers paradise, Keswick. The mountain festival is held every year and we thought it would be good to combine it with a group weekend away. Keswick, according to your man Alfred Wainwright “is…the best single base of operations.” It is indeed a great location for all kinds of walks along with many options for accommodation including B&Bs, Hotels and Campsites. Long and shorter group walks will be arranged for during the day but the festival also offers many activities that you may like to try. On both Friday and Saturday evening there is live music at the festival park where the stage, overlooking Derwent Water and surrounding fells, must have the best backdrop of any venue in the country! We will be arranging a pub meal for the group on Sunday evening. Details: Sheffield Big Soul Night - a night not to be missed. Three rooms of incredible northern soul, Motown hits and modern soul anthems! All for only £10. The event is at Sheffield City Hall Ballroom. We will meet in the Benjamin Huntsman pub at 8 15. After party at The Old Crown 137 London Road S2 4LE where the excellent Highway Child, will be playing. Payment in advance before Monday 3rd April 2016 by electronic transfer to Sheffield 40s Walking Group sort code 60-83-01 account no 20198167. Please send us an email to swg40s@hotmail.co.uk to let us know your pie preference and to tell us you have sent the money. Those wanting to pay by cheque please text Jean 07795 203867 who will give you an address. We will be spending this year’s Easter Weekend in and around Middleham, North Yorkshire. This picturesque village near to Leyburn offers great walking along with pubs, shops and cafés plus a ruined castle. A variety of group walks will be available over the weekend, ranging from short and easy to long and hard. Middleham is also home to several racing stables. The stables hold an annual open day on Good Friday which hopefully they will doing so again for 2016. This is a great opportunity to see these beautiful horses if you fancy it. A meal at the pub will be arranged for Saturday evening. Staying at ‘School House’, the property will accommodate 16 people sleeping 2 – 4 per room and is perfectly located in the centre of town. The total cost for the 3 nights accommodation is £102 per person. Bookings will open on Tuesday 1st December 2015. Please text Jill Brogden on 07940 415 695 to book a place. Payments by Bank Transfer please to Sheffield 40s Walking Group; Sort Code 60-83-01 (note new sort code), Account number 20198167. Payment to be received no later than 25th January 2016. If you prefer to pay by cheque, please let us know when texting to book on. You are welcome to book your own accommodation and join us. As always, please remember to bear in mind if we do not fully book the house SWG40s have hired, this group weekend away may not run. Details: We have booked places at Otto's Moroccan Restaurant on Sharrow Vale Road from 7.30 p.m on Friday 26th February . We have been here before and it is always a really good night. Please contact either Sue or Lyn ( phone numbers below) if you want any further details. www.ottosrestaurant.co.uk and scroll down to the bottom to select party menus. Sheffield 40's Walking Group, sort code 60-83-01 account no 20198167. Please can you state on the payment that it is for Ottos to help Jill (and us). Please text us if you would prefer to pay by cheque and we will let you know how. We do hope you can join us and people are also meeting up in the Porter Brook afterwards from 8.30 p.m. onwards if you can't make the meal. Details: Pub crawl starting at the Benjamin Huntsman 8.00 pm. See Jean 07795 203867 or Jillian 07771 960531 for more details. Details: The third week of January is said to be the most miserable week of the year so I thought we might cheer it up with Brunch at the Milestone pub, Kelham Island, on Saturday 23rd at 11am. They do a very good deal - two people get a brunch dish, glass of fizz and hoot drink for £14 ie 7 quid each. Am hoping we have an even number of bookings to make this work! If you would like to come along please let me know by Wed 20th January so I can confirm numbers. Please text Debby on 07791 143494. Details: Fun Games night (please bring any games, Monopoly, cludo etc.) at The Fat Cat from 8.00 pm in the upstairs room. See Tracey 07903 440314 or Mave 07792 575698 for more details. Details: We plan to have two lead walks from Over Haddon car park (grid reference white peak east SK202665) starting at 10.15 a.m. on Sunday 13th December. The leaders will be Sue who will guide an 8/9 mile walk and Jean who will guide an 11 mile walk. Details to be announced in the walks calendar. Members are welcome to both events, but may just book the walk or just book the meal. There are spaces for 50 people in the restaurant. To book the meal members should send their money by electronic transfer before Friday 4th December to account no: 20198167 sort code 60-83-01 (note new sort code) or email swg40s@hotmail.co.uk and we will send you an address where to send a cheque. Please let us know your food order by emailing swg40s@hotmail.co.uk Alternatively, the money may be given to a committee member on a walk (remembering to tell them what you want to eat). As we will be eating at 5.00 p.m. there will be a mince pie and drink only stop on the walks. The hotel has asked that we do not take in boots or rucksacks. Wherever the evening takes us! Details: Meet at Fat Cat 8pm and lets see where the evening takes us. Be prepared to walk uphill. For further information contact Jean: 07795 203867. Time: Starts when walk ends - maybe 4pm - lights switch-on is 4:30pm. Note parking will be very difficult. Details: Pub crawl around six pubs in Castleton, watch the Castleton Christmas lights switch-on at 4:30 pm, and catch one of the buses back to Hathersage / Sheffield. There is an optional walk beforehand - see walks page for details. Public transport to the social is advised as it will be very busy due to the Castleton Lights switch-on. The No. 272 bus will leave Sheffield Interchange at 10:45, travel along Ecclesall Rd. / Ecclesall Rd. South and arrive in Hathersage at 11:26. If you prefer to drive there is a pay & display car park in Hathersage on Oddfellows Road opposite the swimming pool (c£5.50 per day) or you may be fortunate and find free street-parking. A fun evening leisurely swimming in a heated pool whilst listening to music and / or enjoying a nice warm (non alcoholic) drink on the veranda. (We will retire to a hostelry afterwards). Details: The centre is located at Ceunant, 10 minutes from Llanberis by car. Its situation on the north westerly slopes of the Snowdon massif gives fine panoramas of Anglesey and the Llyn peninsula. Accommodation at the centre is hostel / bunkhouse style. There are around 20 places available, sleeping 2 – 3 per room for 2 nights costing £45 each. We are planning to have a group meal at the centre on the Saturday night. Please note – Due to location and limited number of places available on walks, it is unlikely booking alternative accommodation is suitable for this weekend. The choice of either a hard or a medium grade walk will be available on both Saturday and Sunday. Only 2 places left. Please text Jill Brogden 07940 415 695 to book a place. Payments by Bank Transfer please to Sheffield 40s Walking Group; Sort Code 08-60-01 Account number 20198167. Payment to be received no later than 31st July. If you prefer to pay by cheque, please say when you book on. Sheffield, S1 4HP ending with a dance at the Dog & Partridge, Trippet Lane. A sociable walk to the end of Spurn point & back, along track, sand dunes and beach. The road has been washed away in one point and surfaces can be bumpy. There will not be many migrating birds in August but lots to see with views up the estuary and out to the North Sea. Lots of shipping to watch. The shipping lane is very close to the end of the point which means the big container ships come close in. The only place where the RNLI has a full time paid life boat pilot. Also the coast guard station is at the end of the point. If we are lucky we will see seals. Kilnsea Car Park is in a pleasant location, therefore, it would be good to spend some casual social time there at the end of the walk before going to the Crown & Anchor. Bring camping chairs & sun tan lotion. See the associated walk for more details and how to sign up and to arrange car sharing etc. 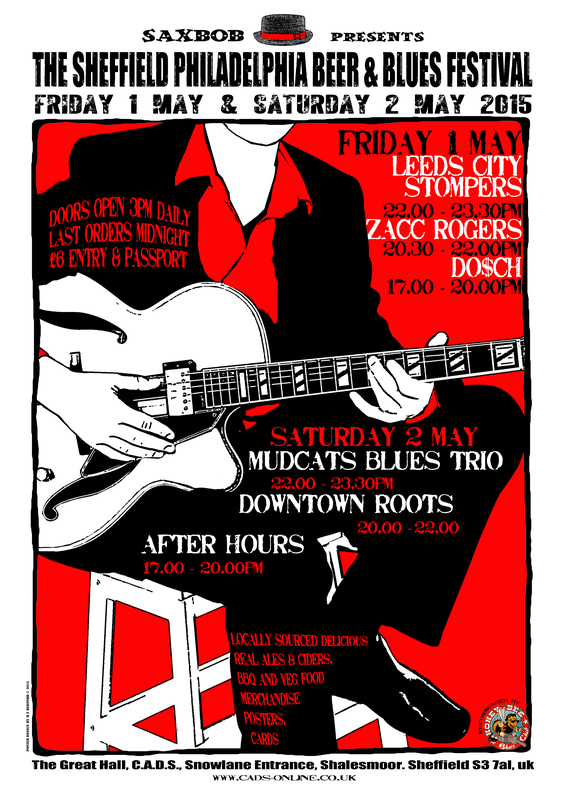 Details: Saxbob presents "Tramlines Blues and Ale Stage". Real ale, BBQ, vegetarian food, great music. Free entry. Location: C.A.D.S. 7 Smithfield, Shalesmoor, Sheffield, S3 7AR. The cost is £19 per person for the 2 nights camping. Details: Meet Shakespeare Pub 146-148 Gibraltar Street, West Bar, Sheffield, S3 8UB, moving onto Brooklyn Bar, Ball Street S3 8BR, then Fat Cat and afterwards The Riverside for a dance. Contact Jean 07795 203 867 for further information. There are 20 places available in the bunkhouse sleeping 2 - 3 people per room. All rooms are ensuite but you must take your own duvet pillow & towel. Arrival after 4.00 pm Departure 10.00 am, Drying room, Cycle store, Laundry, No dogs. To book a place, please text Jean Billingham 07795 203867. Payments by Bank Transfer please to Sheffield 40s Walking Group; Sort Code 08-60-01 Account number 20198167 to be received by 31st March. If you prefer to pay by cheque, please let us know when texting to book on. The meal and local transport for the walk has only been booked for the 20 places available at the bunkhouse. Please book your reservation for the Saturday meal direct with Links Hotel and ask to be seated with Sheffield 40s walking group. There are a few extra places available for the transport taking us for Sunday’s walk. Arrangements for this can be made once we are in Seahouses. Please text Jean to let her know you are joining us so we can include you in any further information we send out. Details: Philadelphia beer & Blues Festival - Presented by Sax Bob at C.A.D.S., Snowlane Entrance, Shalesmoor, S3 7AL. Some of us will be attending the festival on the Friday and Saturday. - Friday - please text Jean on 07795 203 867 to let us know you are coming. - Saturday - please text Wayne on 07793 241 798 to let us know you are coming. Kettlewell long weekend, Yorkshire Dales - now fully booked, sorry. Join us for Easter in the Dales, at Kettlewell, Upper Wharfedale. We are staying at Dale House and have self- catering accommodation available for 20 people, sleeping 2 – 3 per room. Dale House is situated within the picturesque village and has pubs, tearooms, shops and, of course, fabulous walking available right on the doorstep. Total cost for 3 nights accommodation is £76 per person. Tables are booked for a meal at The Bluebell Inn on Saturday Night. Booking opens Monday 19th January. To book a place, please text Jill Brogden 07940 415 695. Payments by Bank Transfer please to Sheffield 40s Walking Group; Sort Code 08-60-01 Account number 20198167 to be received by 31st January. If you prefer to pay by cheque, please let us know when texting to book on. Details: As advertised in Exposed Magazine - Peddler Market in Sheffield offers an evening of good food and drink, live music, unconventional market stalls, pop up art gallery showcasing some of Sheffield’s best artists, craft beer. The market also features an ever changing roster of fantastic street food vendors alongside a mountain of local and independent businesses peddling their wares. We shall move on when everyone has had enough of the market. After the market there is a great Soul Band called Highway Child playing at the Old Crown London Road at 9.30pm. Details: Chesterfield & District CAMRA 2015 Beer Festival. Friday 6th Feb, at the Winding Wheel, Chesterfield. For tickets, please contact Clair by end January on 07817000406 or gobbyduck@hotmail.com and she will get them for you and you can pay by bank transfer and can collect them on the door. Details: Meet at 8pm at the Devonshire Cat Wellington Street, Devonshire Green, S1 4HG moving on via The Tap and Tankard, 24 Cambridge Street, Sheffield, S1 4HP towards dancing into the small hours at Dada Trippet Lane Sheffield S1 4EL. Any enquiries to Jean 07795203867. Details: December 12th, 8pm until 1am. Come and join the party, with buffet and DJ, at Bar Phoenix, in the iconic building The Hubs, 6 Paternoster Row, Sheffield, S1 2QQ. 1. Get tickets from a committee member on a walk - you can pay by cash, or cheque payable to "Sheffield 40s Walking Group"
2. Pay by bank transfer to "Sheffield 40s Walking Group", Sort code: 08-60-01, Account: 20198167, . Please include your name in the payment reference, and email the Social Secretary at swg40s@hotmail.co.uk to confirm you have sent the payment. 3. Email the Social Secretary at swg40s@hotmail.co.uk for information if you want to post in your payment. Last date for purchase of Christmas Party Tickets Monday 1st December 2014. Meeting at Henry's Bar, 28 Cambridge Street, S1 4HP (back door John Lewis) at 8.00 p.m. Moving on at 8.20 p.m. to Wong Ting Chinese Restaurant, 6 - 8 Matilda Street, S1 4QD. Derek organised the last visit to Wong Ting it proved to be a very successful evening. A deposit for the meal is not needed but please text Jean on 07795 203867 so she can confirm numbers. Join us for a fabulous weekend staying at Stanley House, Eskdale, in the Western Lake District. The area offers something for everyone – from a relaxed stroll along the gentle lanes to a rigorous assault of Scafell and Pike. Stanley House sits amongst a host of local attractions and some of the area’s most stunning vistas. There are two fine Inns within a 10-minute walk. Packed Lunches can be ordered from £5. There is also a large self-catering kitchen. Price per person £105. Single occupancy room £125. Bookings open Monday 14th July. For further info - www.stanleyghyll-eskdale.co.uk and eskdale website. Please note: Ratty Railway will not be running on this weekend – Sorry James…! As Ten Pin Bowling never got organised, it is now proposed to hold a pub meet starting at 8.30 p.m. on Friday 31st October 2014 at The White Lion Pub, 615 London Road, S2 4HT. Moving on later to The Brothers Arms, Well Road S8 9TZ. As this is short notice and Halloween please text Jean to let her know you are coming 077952 03867. Details: 8.00 p.m. Friday 26th September 2014 at the Hillsborough Hotel (54-58 Langsett Road Sheffield S6 2UB) for Fish and Chips £5.00 (they stop serving at 9.00 p.m.). Then when everyone has dined & wined moving onto The New Barrack Tavern (601 Penistone Road S6 2GA) to the 601 Club for some free Northern Soul. The Hillsborough Hotel is half way between Infirmary Road & Langsett Road/Primrose View Tram stops. Please can you let Jean know by texting 07795203867 before Wednesday 25th September 2014 if you want food ordering. The pub offers Fish/Sausage/Fishcake and chips & mushy peas. Details: Come and explore the beautiful valley of Clun in Shropshire which is near the market town of Ludlow. A rural gem in the South Shropshire Hills. It lies in a designated area of outstanding natural beauty close to the border with Wales in what is termed the Middle Welsh Marches. Discover the Shropshire hills area of outstanding natural beauty. The countryside in south Shropshire has valleys, ancient woods, meadows and of course, hills to conquer! There's Offa's Dyke, the Shropshire Way, the Jack Mytton Way and numerous local short walks. The Long Mynd in Church Stretton has more than 30 miles of footpaths. The plan is to camp at Hurst Mill Farm ( pitches have been reserved under Sheffield 40's )(www.clunholidays.co.uk) It is a designated camping and caravan site and only a mile from the village of Clun where there is a real ale pub, shops and even a ruined castle! Or there is the Youth Hostel (www.yha.org.uk/hostel/clun) only afew minutes drive away which is a restored watermill. For those of you who want a B+B there is the Crown Inn ,White Horse or the Farmhouse in Clun. We intend to offer two walks on the Saturday and Sunday -if you would like to lead a walk please let Jude know asap. So go ahead and book the accomodation that you require either camping/hostel/ B+B/or.......... and then text Jude 07788413274 that you are coming and if you would like to come for the meal on the Saturday night. If the weather is good a BBQ might be possible! Details: Please join us at 8.00 p.m. on Friday 8th August at the Harrison Bar, 15/29 Regent Terrace, Sheffield S3 7QA (just off West Street behind Sinclair’s shop). We will move on at approx 8.45 p.m. to go on a pub crawl, followed by a dance at either Cubana’s or Dada bar. Any further information required please contact Sandra or Jean on the group email. Details: TIckets can be booked online via this link:http://www.chatsworth.org/.../events/event/proms-spectacular Should be a great evening in fantastic surrondings. Details: Music in the Gardens are proud to welcome the mighty Heaven 17 to the Botanical Gardens for one night only! The brainchild of Martyn Ware and born from the collapse of the original Human League, Heaven 17 is a musical project that has stood the test of time to influence the future of modern music for over thirty years. Their first album, Penthouse And Pavement, is and remains, a modern classic. Glenn Gregory and Martyn will perform hits from their overwhelming back catalogue of funky, electronic hits including Temptation and (We Don’t need This) Fascist Groove Thang. Don’t miss your chance to catch these electro pioneers in their hometown. Buy your tickets online : www.musicinthegardens.co.uk Let Maria Hardy know if you're joining us for this fun open air event. mhardy65@live.co.uk 07950600683. Details: There will be an event at Wincobank Common with big screens, refreshments and food. It is adjacent to a very steep hill at Jenkin Road, which will be a good place to watch the riders go by. If anyone is interested then please add to the thread on the message board. Details: Back to Dent for fun and dancing. Pitches available £10 a night per person. Book with Sandra 07709 609864 and pay Jill Brogden. Wrist bands can be bought at Dent to get a discount off beer. This is a charity event so if you want to donate there are donation buckets around the bar areas. Details: We are returning to the Chamois MC Centre for another weekend of fun filled activities! The Centre is about 10 minutes drive from LLanberis and enjoys extensive views of Anglesey and the Lleyn Peninsula from its position approx 750 ft above sea level. It is planned to offer short and long walks on both the Saturday and the Sunday, with a buffet style evening meal on the Saturday evening. Details of requests for contributions to follow. Accommodation is available for approx 20 people in dormitory style accommodation. More info on the centre can be seen at www.chamois.org.uk. 2 nights accommodation at the centre is £35 per person. Bookings will open 6pm Monday 17th March. Please text Monica Brinkman to reserve a place. 075844 21580. Details: Meeting at 7:30 p.m. at The Fat Cat, 23 Alma St, Kelham Island, Sheffield . ALL welcome. Come and share a drink or two with us from 7:30 p.m. moving on to wherever takes our fancy later on. Details: Meal Friday 2nd May 2014 7.30pm at Otto's Turkish Restaurant, 344 Sharrow Vale Road, Hunter's Bar, Sheffield. S11 8ZP. Join One Step Walkers for this long Easter weekend in the superb Burley YHA, used last year by NDWG, at a cost of £72 for 3 nights bed and breakfast. There will be heathland and forest walks available from the doorstep, plus coastal walks on the Solent Way and on the Isle of Wight. The area is also a mecca for cycling, horse riding and all manner of boating things. You’ll be spoilt for choice with so many beautiful places to visit. To book your place, contact the weekend leader Phil Bridden by e-mail on philbridden@gmail.com and also Dave Croft on dave.croft@rolls-royce.com. Payment can be made by cheque or bank transfer – please send a cheque made payable to The Ramblers to Dave Croft at 51 Mear Drive, Borrowash, Derby, DE72 3QW, or make a bank transfer to the One Step Walkers account 20249993, bank sort code 08-60-01. Plans are well underway for 2014’s Magnificent Walk. This is a great day out which is fun and suitable for all levels and ages of walkers, including toddlers… so everyone can enjoy themselves and you will be giving valuable support to Friends of the Peak District too. There's a £10 charge for adults to join a walk (£12 on the day). Children (under 16s) free. The booking form is on our website so use this link to book your place now. Coffee/tea and breakfast butties will be available at the beginning of the walk, and coffee/tea and cakes at the end. Details: HOWGILL FELLS 21st - 23rd MARCH 2014. We are heading off for an early spring weekend of walking, socialising and other such pleasures! Situated between the Lakes and the Dales, the Howgill Fells are a real gem. Short and long walks will be available on both Saturday and Sunday and a meal at the Dalesman Inn has been arranged for Saturday night. www.thedalesman.co.uk. Staying at the Howgills Bunk Barn, Sedbergh, in the Yorkshire Dales National Park, accommodation is available for approx. 20 people. www.howgillsbunkbarn.co.uk. 2 Nights accommodation in the Bunkhouse is £60 per person. Rooms sleep 2 - 4 people. Description From Middleham, up to Leyburn, Leyburn Shawl to Preston Under Scar, Redmire, Bolton Hall, Lords Bridge, West Witton, Middleham Moor. Additional Information For those onroute to Sedbergh/Howgills or anyone who fancies a Friday day out. Please ensure you are ready booted and equipped to start walking at 10.00 a.m. The route from the M1/A1 goes via Bedale. Please text earlier rather than later to ensure optimum planning. Details: The Sierra Nevada is Spain's largest national park; at its centre is Mulhacen, the highest mountain in mainland Spain. There are great opportunities for walking and mountaineering - from short strolls through terraced valleys to multi-day treks traversing much of the 3000m peaks. The area has interesting wildlife, archaeology and architecture having been influenced by Berbers from North Africa for hundreds of years. Details: Join us for Thai meal at 7.30pm on Friday 28th February at The Orchid, 217 -219 London Road, Sheffield. S2 4LJ. £15 per person for three course meal, full payment required at time of booking please. To book please contact Maria Hardy on 07950600683 or email mhardy65@live.co.uk. More details and full booking information will be available nearer the time.